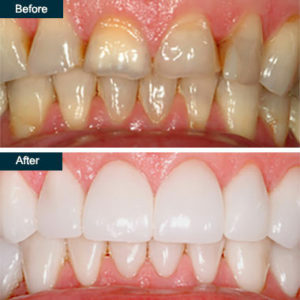 Porcelain crowns for your teeth look natural and function just like your own teeth. A porcelain crown costs a little more than an acrylic crown, but it also lasts a lot longer. How long do porcelain crowns last? Up to 30 years, when fitted properly by a Bronx dentist (conveniently open on Saturday and Sunday). Porcelain crowns are long-lasting and worth the investment. They look as real as your own teeth, and they’re perfect for covering weak and damaged teeth. Teeth sometimes get broken, have extensive damage from disease or need to be replaced, both for cosmetic and functional reasons. If you find yourself in this situation, it’s likely you want to make sure you pick the best long-term solution that works for your lifestyle. If you don’t need implants, but still want to have a beautiful-looking smile, consider the benefits of porcelain crowns. Because they look just like your natural teeth, no one can tell you’ve had work done when you sport a porcelain crown. You won’t have to worry about your crown staining, and they provide even weak teeth with a strong foundation. You have this option because you’ve found the best dentist in the Bronx — one who’s both a family dentist and a cosmetic dentist. He can help you make the best decision for your health, your appearance and your wallet. A porcelain crown covers and replaces a tooth cap that has been chipped or broken. Crowns come as both inlays and onlays. A dental inlay fills spaces within the rounded edges of a tooth, usually at the center of your tooth’s surface. An onlay is similar to an inlay, but it covers one or more edges. An onlay can even cover the whole biting surface. Dental onlays sometimes are called partial crowns; your dentist (conveniently open on Saturday) may also call them caps. If you have one or more teeth that are mostly healthy, but have large fillings, a crown might be the best option for you. Having a porcelain crown put in takes at least two visits. If you worry about missing time at work, consider visiting a dentist open on Saturday. When you go in for the first visit, your top Bronx dentist inspects your tooth to determine if a root canal is needed first. Not everyone who needs a crown must have a root canal. During the first visit, the dentist files the tooth down, giving the crown room to fit. You’re given a temporary crown to wear while a permanent, custom-fit crown is being made. The dentist makes a mold of your tooth, ensuring your regular crown fits in with your smile. On the second visit, the permanent crown is installed. If you’re wondering, how long porcelain crowns last, your temporary one is only good for a year at the most. Typically, you wear it only for a couple of weeks. And if you’re wondering how long permanent porcelain crowns last, expect them to remain whole and intact for up to 15 years before you need a new one. The process of having a porcelain crown put in doesn’t take a lot of time. If you’re trying to avoid missing work or school, consider visiting a dentist open on Sunday to avoid these issues. The first visit takes only about half an hour if your tooth is properly prepared and doesn’t need any other work. When it’s ready, installing your porcelain crown takes only another 30 minutes. Your dentist numbs your mouth when he puts the permanent crown in place, so you won’t feel pain. After the numbness wears off, you’ll notice some minor discomfort. Within a day, however, your mouth should be back to normal. It’s rare, but sometimes, your crown falls out and needs to be re-cemented. In this case, try to see the dentist as soon as possible so you don’t irritate the tooth and create further problems. Seek a Sunday dentist in the Bronx to fix it as soon as possible if you run into this issue. Porcelain crowns don’t have long-term problems, and in fact, they often do more to help you avoid future dental problems. Having a crown allows you to avoid implants and other solutions that involve a higher cost. The result is a smile that looks natural too. After having a crown put in, you might want to take it easy for the day. Seek out a Saturday dentist so you can take the time you need to feel better. Let your dentist know if you experience problems during the fitting, so he can make adjustments. After your appointment, avoid foods that are sticky or hard. Although your crown has been put in place, the cement may not be fully set, so the crown can still come out. Porcelain aren’t cheap, so consider having soup or foods you can chew easily. Your family dental team’s primary concern is for your oral health and overall well-being, so you can expect to go home with detailed instructions for how to keep your crown clean and how best to undergo a safe recovery from the whole procedure. Do you have any questions about porcelain crowns in the Bronx NYC? Would you like to schedule an appointment with the best cosmetic dentist in the Bronx in Dentist in the Bronx NYC? Please contact our cosmetic dental clinic for a consultation with the dental crowns specialist Farzin Farokhzadeh, DDS.